Pristine, One Owner, Inifiniti QX60 AWD***Leather, Navigation, Remote Start*** Only 25k miles! 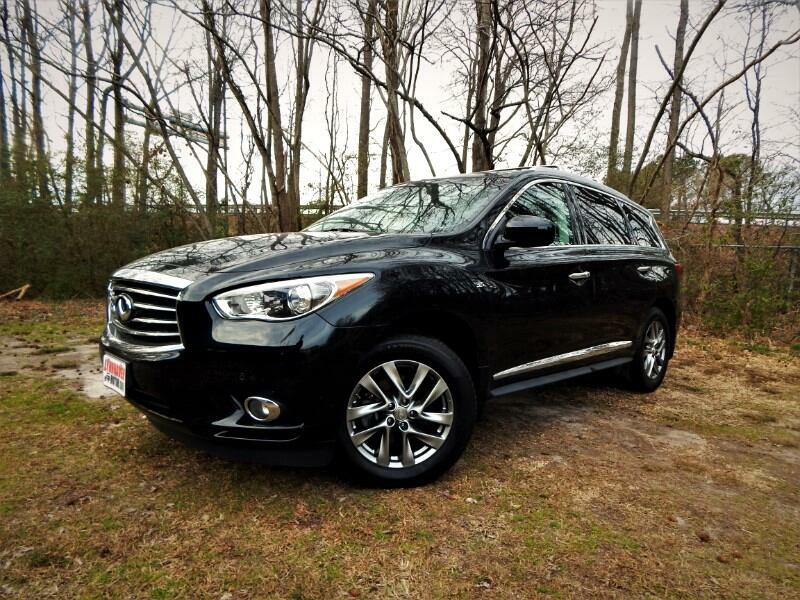 2015 Infiniti QX60 AWD,Navigation, Sunroof, Loaded, 25k Miles! Trim:AWD,Navigation, Sunroof, Loaded, 25k Miles! Like New, 2015 Infiniti QX60 AWD, LEATHER INTERIOR, SUNROOF, REAR PARKING AID, THIRD ROW SEAT, Only 25k Miles, NAVIGATION, MEMORY SEATS, CARFAX/AUTOCHECK and STATE CERTIFIED w/BUYBACK GUARANTEE, Premium Alloy Wheels, REMOTE ENGINE START, KEYLESS ENTRY, MP3/Satellite Radio Compatible, Loaded w/Power Options, HID Headlights, Heated/Memory Seats, STILL UNDER FULLY TRANSFERABLE FACTORY WARRANTY...The 2015 Infiniti QX60 is a three-row luxury crossover that puts families first. Based on the versatile Nissan Pathfinder, the QX60 has plenty of room for adults or growing children in all three rows, and the second-row seats slide and recline to enhance passenger comfort. Moreover, we've found the ride to be exceedingly comfortable on a variety of surfaces, with little road noise making its way into the cabin. The interior also benefits from top-notch materials and user-friendly technology features, and the QX60's pricing is significantly lower than that of some rivals. The QX60 is fairly quick, and the suspension coddles up to seven passengers with a supremely soft ride. The interior is well-packaged, too, with a neat forward-sliding second row that allows easy access to the third-row seats through the wide rear doors. If you’re not seeking any sportiness from your luxury crossover, the QX60 obliges nicely with its isolated driving experience. As with any other of our vehicles, you may have this one pre-inspected by your trusted mechanic prior to purchase. We strive to only keep high quality vehicles with low mileage offered at the most competitive price. We are a family run independent Dealership with over 30 years of experience serving families, and our low overhead translates to lower prices for our customers. Each of our pre-owned certified vehicles goes through a 108 point check and Virginia residents receive a brand new State Inspection. Visit us online at www.lynnhavenmotors.com to see more pictures of this vehicle, or call us at 757-425-9300 today to schedule your test drive. Vehicle Inquiry for 2015 Infiniti QX60 AWD,Navigation, Sunroof, Loaded, 25k Miles! Trim: AWD,Navigation, Sunroof, Loaded, 25k Miles!